If you polled a group of engineers and producers, asking them what’s the best way to record electric guitar, probably 99% of them would say by miking an amp — preferably a tube amp that’s turned up really loud. Ah, punk! Some say it's enough to pick a guitar, an amp, a jack, and a strap (the longer the better), crank it all up and it should sound like it's meant to. After having found your clean sound, let's now look at how to color your sound with a bit of distortion. We have already seen how to set correctly the knobs of your instrument. But we still have to shape the signal before it comes out of the loudspeaker. How To Adjust Guitar Knobs Correctly - What Are The Knobs On A Guitar For? Sure, you can grab your guitar, crank up all the knobs and play. But if all those controls are there, they must serve a purpose! "...must be funny...in a midget's woooorld". It's probably what ABBA would've sung if they had started their career in 2013. Indeed, this year has seen the appearance of a good number of bonsai-sized and more-or-less useful pedals. Line 6 POD HD500X Review - Are you POD-to-date? A guitarist must frequently adapt to the voice of the singer and specially to his or her own vocal range. How should this be done? 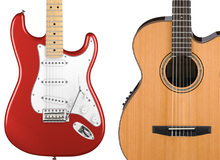 Choosing the Right Electric Guitar String Set - Which electric guitar string set should you buy?